The largest crayon in the world was created from 123,000 used (or broken) blue crayons which were donated by people and children from all over the world. It's on display at the Crayola gift shop in Easton, Pennsylvania, USA. One of my fondest childhood memories is opening a new box of crayons and colouring anything I felt like on a fresh piece of paper. It's something that still tickles me whenever I see kids in restaurants drawing on their placemats. Hey, why didn't we get those? And it wasn't until my daughter was of crayon-drawing age that I discovered some of the wonderful green initiatives that Crayola was implementing. In fact, their latest effort has made its way into Canada. If you buy Crayola markers, you might have noticed they are black with coloured caps now. Switching to black barrels keeps hundreds of tons (or tonnes) of plastic out of landfills every year. What impressed me is how this all came about - it was a commitment to do the right thing. 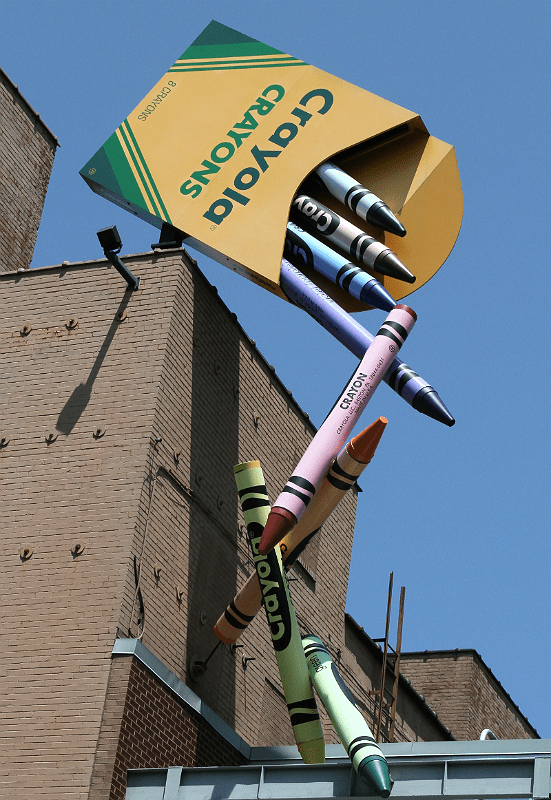 Crayola sets a fine example for other companies in the world and they certainly deserve recognition for their efforts. 1) A reduction, in the order of about 1,900 tons (about 1,725 tonnes) of greenhouse gas emissions per year. 2) A reduction in solid waste of about 45% in 2011 (with a projected 2% further reduction by 2015). 3) A reduction in water usage of about 12% in 2011 (again, with a further 2% reduction predicted by 2015). To put all this into perspective, Crayola's green efforts are deemed the equivalent of planting 400 acres of pine forest or sparing us from burning 200,000 gallons (almost 760,000 litres) of gasoline every year. In 2011, Crayola won the American Lung Association's Mission Award for improving air quality and PennFuture's "Green Power: Turn It On!" award for promoting green energy. The solar farm provides enough electricity to produce a whopping 1 billion crayons and 500 million markers a year. Over 26,000 solar panels installed by women and men on 15 acres of land to produce 1.5 megawatts of electricity. And Crayola isn't stopping there. With another 10 acres of land, almost 40,000 solar panels will be in place to produce a massive 3 megawatts of power. That's enough to produce 2 billion crayons by the power of sunlight alone and reduce greenhouse gas emissions by 3,800 tons (3,447 tonnes) per year. Up next, an inspiring video (under 4 minutes) of Crayola's Solar Farm (uploaded by KidsToyTV). The story gets even better. Children at Concord and Sun Valley elementary schools in California joined forces and wrote letters to Crayola asking them to recycle their markers. 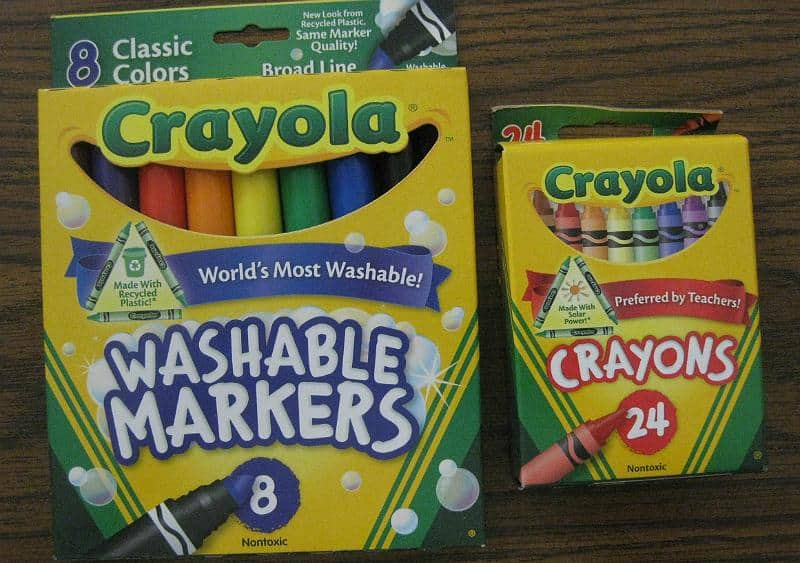 Incredibly, Crayola did more than step up to the plate. They created a program to educate children about the environment and even pay the cost of shipping spent markers to be recycled. An added bonus is their pre-paid FedEx shipping labels which are provided to participating schools. What's more, Crayola's ColorCycle program accepts all brands of plastic markers, not just Crayola markers. And they accept highlighters and dry erase markers too. 1) JBI, Inc., a company that turns plastic into liquid fuels, will recycle the plastic casings of dried out markers to create a cleaner, low sulfur fuel. 2) Crayola did the leg work of researching the most beneficial method to repurpose their markers and provide learning resources for schools to teach students about recycling and other environmental solutions. 3) With just over 300 markers, JBI can create 1 gallon of fuel. Founder John Bordynuik confirmed that partnering with Crayola diverts plastic waste from landfills and/or incineration. Presently, any Kindergarten through grade 12 school in the contiguous 48 United States and many areas of Canada can take part in Crayola's ColorCycle program. When I checked the registration information on Crayola's website, I discovered that the following provinces in Canada are included (based on postal code information): BC, Alberta, Saskatchewan, Manitoba, Ontario, Quebec, New Brunswick, and Nova Scotia. What's the wonderful thing about all of this? 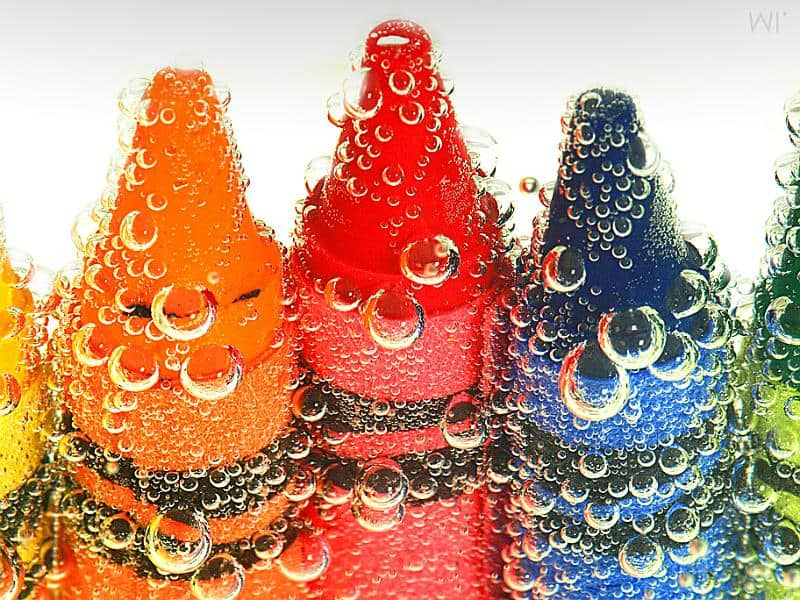 Consumers don't need to pay more because of these initiatives - Crayola is absorbing the massive manufacturing costs of going green "because it's the right thing to do." Up next, enjoy the inspiring video uploaded by Michael Carroll May 24th, 2013. There wasn't a dry eye in my house when I showed it to friends and family. It documents the efforts of children at Concord and Sun Valley Elementary schools to encourage Crayola to develop a recycling program for their markers.